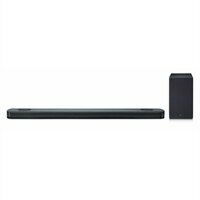 LG SK9Y 5.1.2 ch High Res Audio Sound Bar with Dolby Atmos® - 500 WattExperience cinematic sound at home. With Dolby Atmos, the action can move anywhere in three-dimensional space, including above the listener for the ultimate in surround audio. Digital music for audiophiles, with higher sampling rates and bit depth, both of which can contribute to more accurate, more enjoyable music listening. This certified high-resolution audio sound bar can play back lossless stereo audio at up to 24-bit/192kHz quality. Experience cinematic sound at home. With Dolby Atmos, the action can move anywhere in three-dimensional space, including above the listener for the ultimate in surround audio.